Google Ngrams is a fascinating visualization tool for studying word frequency over time in the 15 million books that are part of the Google Books project. The research that led to the creation of Ngrams was a cooperative effort between Google and Harvard University. 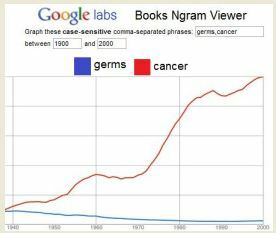 Posted in Google, Google Book Search, History, PicsYes, Uncategorized, Visualization. A book properly hooked into the Internet is a far more valuable collection of information than a book not properly hooked into the Internet. … The false battles between ebooks and print books continue to ignore the real, though as-yet unknown, value that comes with books being truly digital; not the phony, unconnected digital of our current understanding of “ebooks.” … We still consider that books live outside of the Internet. There is massive and untapped (and unknown) value to be discovered once books are connected. McGuire says our idea of what an eBook should be still carries a lot of baggage from our idea of what a book is — We still think of eBooks as being separate from the Web — In particular, eBooks, like print books, are not searchable or linkable, and text can’t be copy-pasted. But full view Google Books are searchable, linkable and deep–link–able, and text can be copy-pasted. Being able to find books in a Web search is a key to removing the barrier between books and websites, as McGuire says, and Google has been bringing that capability to reality, as they steadily work with libraries to scan their books. Searching for books within Book Search has been part of GBS since the beginning. In the last three years or so, books have also been increasingly integrated into Web Search results. This is a big step, I think, in connecting books to the Web — Searching Google is how we find out about things these days, so to be able to retrieve books and web pages in the same search is a extremely valuable — A great advance that’s gotten little attention. Not surprisingly, the people who have especially learned to value bringing books onto the Web are historical researchers — With pre-1923 books being out of copyright, and freely available in GBS full-view searches, historians have quickly taken advantage — In a recent forum of historians on GBS, it’s described with words like indispensable … enlivening. While historians have expressed their valuing of the connected books in Google Books, there are certainly many non-academics with little voice who are also learning to use it. Google engineer Dan Clancy says that half of the out-of-copyright books in GBS have at least 10 pages viewed per month — A large portion of this use must surely be from the general non-academic public. One commenter to McGuire’s article (who apparently doesn’t know about GBS) expresses the voice of this little-heard group: “If books/entire texts were *searchable* on the internet, people searching the web could more easily find exact phrases/specific information in books. To me, this is HUGE!” Indeed — and what a fine, pithy statement of McGuire’s thesis! All of this hidden information — exploded out, made explicit — turns an ebook from a dumb object into a smart object. … Google is staffed by geeks who juggle information with an expertise that print publishers lack. … Google makes information do things. … Print publishing freezes information into a static object — An object that stands alone, disconnected, unable to do anything. … The information geeks are new publishers for a new age … Metadata has value. As new connections are formed, and new data is added, its value increases exponentially. Bringing the world’s books to digital life on the Web, whether it’s done by Google or someone else, is a story that’s just beginning. For now though, Google Book Search gives us a start in exploring the new world of the book and the Internet. Posted in eBooks, Google Book Search, History, Metadata, PicsNo, Uncategorized. Dan Cohen gave an excellent talk in a panel (Is Google Good for History) at the recent annual meeting of the American Historical Association that brought much attention in the media and in Twitter by people following the conference’s hash tag #AHA2010. The main focus of Dan’s talk was Google Book Search — He gave a nicely balanced view, noting that it’s been a valuable new source for historians, but also discussing problems with it, especially what he sees as a lack of openness on the part of Google. mazarines: A transcript by @dancohen of his Google talk at #AHA2010: http://bit.ly/71omcB . He gets to the heart of the problem in section 4. Well said! mazarines: Inside Higher Ed’s coverage of “Is Google Good for History” panel at #AHA2010: http://bit.ly/92Grw7 (via @archivesnext @save4use). ProfessorJTan: RT @DUKEpress: Report on #AHA2010 “Is Google good for history?” panel @theinsider. http://bit.ly/92Grw7 Answer seems to be a qualified yes. mlhalldotcom: RT @dukepress: Report on #AHA2010 “Is Google good for history?” panel @theinsider. http://bit.ly/92Grw7 Answer seems to be a qualified yes. dukepress: Report on #AHA2010 “Is Google good for history?” panel @theinsider. http://bit.ly/92Grw7 Answer seems to be a qualified yes. sherah1918: Catch up on @dancohen‘s #AHA2010 talk, Is Google Good for History? http://bit.ly/51Z94z , & possibly C-SPAN reruns for weeks to come. janaremy: RT @footnotesrising: someone please ask google books rep why they don’t take suggested corrections to metadata from users. #aha2010. footnotesrising: someone please ask google books rep why they don’t take suggested corrections to metadata from users. #aha2010. parezcoydigo: RT @patrickgmj: Librarians being called out on being easy on Google. #AHA2010 The actual phrase was supine before Google. clioweb: Apparently @dancohen likes Google #AHA2010. KevinLevin: RT @dancohen: Transcript of my talk “Is Google Good for History?” for those following #AHA2010 online: http://bit.ly/8qn90g @cenantua for U. Posted in Google Book Search, History, PicsNo, Twitter, Uncategorized. These ideas were bouncing around in my mind when I visited Brian recently at Mississippi State, where he studies, and especially when we got a kind invitation from a fellow grad student to share Thanksgiving dinner with his extended family. The gracious Southern hospitality we enjoyed there was the highlight of our trip, in many ways – Story-telling, food, and much more. Of course, I couldn’t resist making a connection — This is history at its thickest! The rich dimensions of a Southern family! This made me realize that my conception of “thick history” is much like family history — It’s history that takes in all “members of the family” — all dimensions, all of the context of the story. History that values the STORY, and follows it wherever it goes, without trying to fit it into an ideological framework. As I continued to cogitate on the idea of “thick history,” of course, I turned to Google — Searching in Google Web and Google Books, I find that I’m certainly not the first one to coin the term — It’s been used especially in discussions of Keynesian economics, but also in religion and sociology. So I poke around more, and explore the idea that “thick history” resonates with “family” — I don’t find much in Google Web search, but then I turn to GBS and — Bingo! 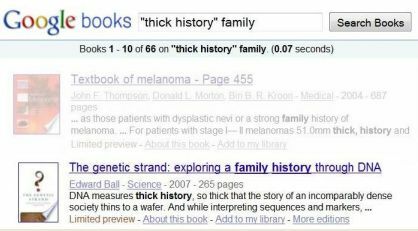 — Searching GBS for “thick history” family, I find just what I’ve been imagining — Number two is The Genetic Strand, with the passage “DNA measures thick history …” This book, by Edward Ball — is “the story of a writer’s investigation, using DNA science, into the tale of his family’s origins.” — with his Southern family being centered in Charleston, South Carolina. No earth-shattering find, admittedly, but a neat little trick nonetheless — Using GBS to make a surprising connection between history and biology that would have been impossible without it. The sort of connection that I’m sure makes GBS invaluable for real historians, enabling them to see history in completely new ways. Posted in GBS Case Study, Google Book Search, History, PicsYes, Uncategorized. As a dilettantish historian, I find Google Books invaluable, especially for 19th century sources. With the chorus of negativity surrounding the GBS Settlement debate, it’s been hard to find anyone saying what seems obvious to me – Whether you like it or not, it’s apparent from the comments below that GBS is revolutionizing historical research. So it was good to come across a recent discussion to this effect among historians on a rather obscure academic listserv (SHARP-L: The Society for the History of Authorship, Reading & Publishing). This is especially interesting because it centers around commentary by Geoff Nunberg in August on GBS metadata as a “train wreck,” which I discussed in articles here. The postings below on the GBS thread are in chronological order. I’ve included excerpts from most of the posts, including representations of all points of view. Most of the postings are in the November archive (thread title: do you use Google Books?). Thanks to @cpwillett for bringing this to my attention. [An earlier] post called to mind a number of recent attacks on Google. I have become addicted to Google Books, which has not only given me access to books that would be hard to find … but has allowed me to find people and passages in books where I would not have known to look. … I’d be interested to know whether other SHARPists find Google Books useful. I find Google Books useful for finding truly obscure references but have learned not to trust either the bibliographical information given in the listings or the integrity of the scanned books themselves. (boldface added here and below) Beth calls attention to a phenomenon that I’ve noticed lately, too: articles sneering at Google Book Search, despite the fact that every serious researcher I know, including myself, now uses it routinely to accomplish certain tasks that would otherwise be very difficult or even impossible to do. The article by Geoffrey Nunberg in the August 31 Chronicle of Higher Education, is typical. That article, which has been widely cited, is entitled, “Google’s Book Search: A Disaster forScholars.” That characterization is flatly ridiculous, and utterly irresponsible. …. The plain fact is that Google Book Search is *not* by any measure a “disaster for scholars”; to the contrary, it is one of the most useful tools that scholars (and other researchers, of all kinds) around the world have ever had available to them, and unlike the many subscription full-text databases, it is available for free to anyone who can muster an Internet connection. … We absolutely do not need are any more sneering dismissals of the entire enterprise. Many books printed in Spanish, esp. Latin America, even important books, were printed without indexes in order to save on production costs. Google Books isn’t fail-safe but it’s better than sitting and skimming huge swathes of text, especially for finding name references. Zachary Lesser, University of Pennsylvania. These comments suggest what I’ve discussed in previous articles. The Nunberg article might as well have been called, “Libraries: A Disaster for Scholars.” After all, I’m sure we could all relate anecdotes about how a book was mis-shelved, lost in the stacks for years, catalogued under an inappropriate subject header, etc. For that matter, one might write an amusing article entitled, “Printed Books: A Disaster for Scholars,” with funny examples of typos. I agree with Patrick and others. Google Books is a useful tool and promises to be even more useful in the future. I think it is especially so for my colleagues working in 19th century (and earlier) materials, and those in the public domain. That said, I’ve been fishing around for texts from the 1940s and have found several of relevance to a current project through Google Books that I could not locate elsewhere. Like any tool, it is imperfect and can’t do everything, … Nunberg was way off base, as Zachary Lesser indicated. I just want to quickly second Patrick’s remarks–especially about the value of GBS (despite its flaws, errors, etc.–one needs to be an aware user). I find GBS indispensable as a finding aid for a host of purposes. I would indeed almost go as far as to say that to criticise Nunberg through the subtitle without addressing his interests and issues directly comes close to being “flatly ridiculous and utterly irresponsible”. (Full disclosure here, I am a friend and co-teacher with Nunberg, while Patrick and I have crossed swords before about Google and its critics and he regards me, as he seems to Nunberg, as suffering from “scholarly fastidiousness” for finding fault with Google.) …. Looking beyond the headline, note that Nunberg is well aware of what Google is good at …. So in no way is his piece a “sneering dismissal of the entire enterprise”. I use Google Books a LOT, especially for my courses. I can assign chapters and sections of books … Google Books frequently helps me answer quickly and easily questions that would have been difficult to research with only Buffalo State’s limited college library … Yes, it has its limitations and yes, it can be frustrating but it has made my job so much easier, and enlivened my research so dramatically, that my occasional whining is lost in an almost daily rush of relief and gratification. Paul Duguid writes that “we need GBS to take metadata far more seriously so that the collection can be examined as an unrivalled and reliable corpus and not simply a bunch of scanned books”. This is, I think, the heart of the issue. As a “bunch of scanned books”, Google Books is very useful indeed. But it could be so much more than that, and it’s the problems that would have been easiest to avoid that are in many ways the most frustrating. Posted in Google Book Search, History, PicsNo, Uncategorized. Evidence Based Medicine? or Medicine Without Numbers? From my college training in History of Science & Medicine, I learned the subversive nature of the discipline — Subversive because it forces us to realize that sometimes we’re not as far beyond ancient methods and ideas as we think we are. How much is there in contemporary medicine that’s still a vestige of the relatively recent past that Barry describes? *Radical mastectomies for breast cancers: The definitive study that disproved the value of this is here. Posted in History, PicsNo, Uncategorized.